I’ve said it before, I’m not much for “novelty races” — mud runs, cave crawls, and the like. It’s not the I mind the events too much, but a lot of them are nationwide touring events with no medals. However, there are a few things that’ll trip my trigger, and pique my interest. One is NASCAR tracks. When I found out that the Color Run Night was gonna be held on the track at Gateway Motor Speedway, I was in. There was no medal, but it was on the track! And then, I discovered that they also had another race from these folks in September, the Color Run Shine, that would have a medal. Woot! I signed up for both. Unfortunately, I got an email a couple of days ago that the Shine race in September was gonna be cancelled. No real explanation, just due to “circumstances beyond our control.” There went my medal, but I still had the race on the track, so that was good. 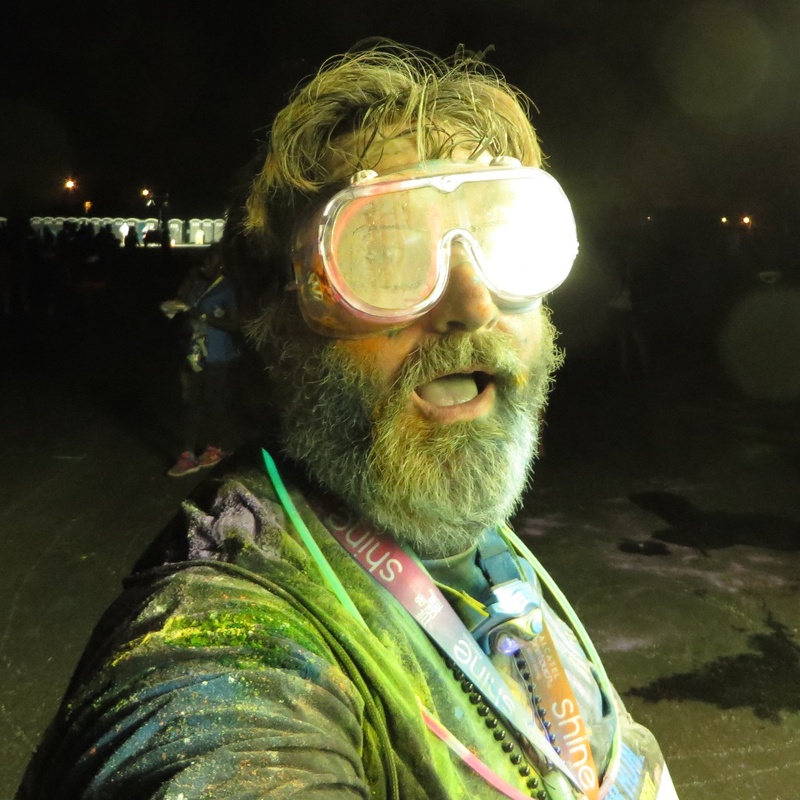 I went out Saturday morning, and started gathering the things I’d need for the race — goggles (to protect my glasses and eyes), a couple of cowbells, and lots of glo-sticks. I wanted to be dressed right for this event! I got to the track a couple of hours ahead of the race start, as suggested, and wandered around the facility. 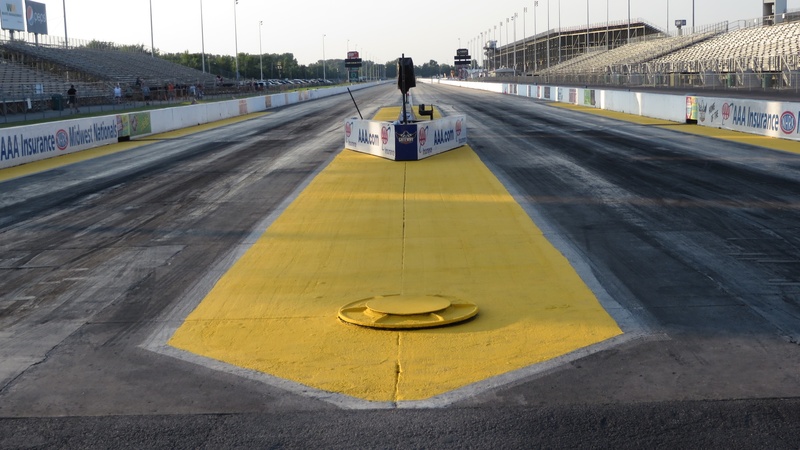 This track is both an oval, as well as drag strip. When I was a kid, I liked drag racing, and it was extremely cool to stand at the start line, and look down the track. As it was really hot — about 90° — I figured I needed hydration and a little food. The concessionaires were dealing, so I scarfed a big ol’ soft pretzel and a bottle of water. And knowing there was no medal, I went to the “company store” and picked up a keychain. I figured I could get some ribbon, and make a medal out of that little plastic do-dad. 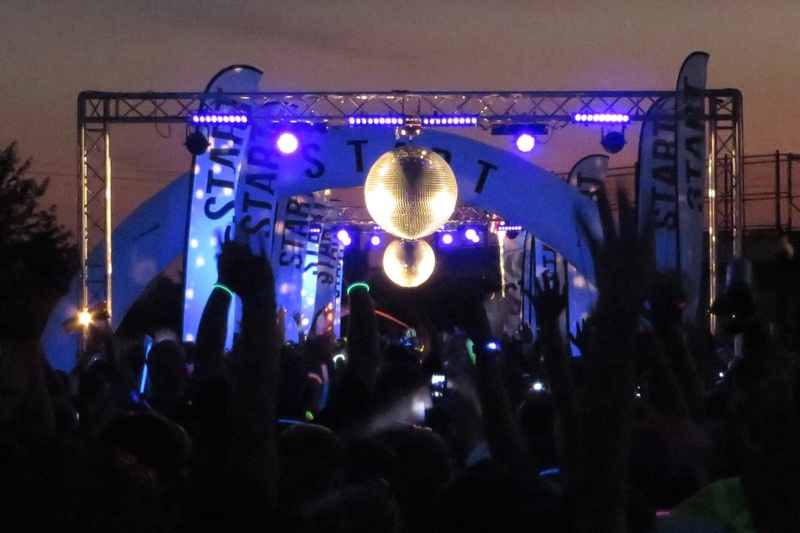 The stage group were whipping the growing crowd into a frenzy, with music, swag flung into the crowd, and group Zumba. It was looking to be a good-sized and energetic group as the sun set, and we got closer to the start time. We started to corral near the start line, and it was evident that this was gonna be fun. Folks had their lights, glo-sticks and glow-in-the-dark stuff revved up, and little by little, we were released in waves onto the course. Shortly after my wave took off, we turned, and found ourselves on the drag strip. Although it was dark, you could still see the dark rubber from all the burnouts. Walking on that, however, was anything but fast. The rubber laid down by all those tires was tacky, and it felt like you were walking on fly paper. Probably the weirdest thing I’ve ever walked on! One after another, the throng I was with crossed into color zones where we were doused in colored powder. There was also a zone with bubble machines, and another with black-light messages on the pavement. From the flats of the straightaways to the banks of the turns, the course was great, and loads of fun. One thing I’ll mention is that the course was short of 5K — my Garmin measured about 4.3km, but with the walk from the parking to the course, and back, I’m counting it as a 5K! Crossing the finish line, I was handed a bag, filled with the same colored powder that was covering everyone. This was for the after-party. And then, someone put a medal in my hand. Now, the medal was a “Shine” medal, not a “Night” medal, but that was fine with me. My guess is that the medals for the Shine event on September 19th were already in town, so they were just used for this event. Works for me! The after-party was a blast. People were everywhere, all covered in every color of the rainbow, and all having a great time. Every ten minutes or so, the announcer would countdown to another “color blast”, which is when those bags of color would be launched among the crowd. It’d look like a massive fog falling from the sky when folks would fling their colored powder in the air. It was really cool, and gave a great medium for the lasers from the stage to shine through. And finally, they had a fireworks show. And not just bottle rockets — real good fireworks that went on and on. When I got home, I got a good look at my clothes, and man was I a mess! I had color-covered arms. I had a color-covered belly — I have no idea how that happened! My shoes were orange. I was a mess. After I got in the house, and figured out how to keep from tracking color all over the place, I hopped in the shower, and began to try to scrub off all the color from me. Frankly, I was surprisingly successful, although there’s still a little color on me. During the shower, though, it looked like someone was wringing out a Smurf — so much dirty blue-ish colored water!! Yeah, I don’t usually do this kind of race, but I believe this may be a return event for me. It was that fun! EDIT: Here’s the video from the race. Warning… it’s kinda long! This race benefitted the American Red Cross of Eastern Missouri.